Cope's Rule : Is Bigger Really Better? They found that when looking at the results after correction there was no significant difference between the number of speciation events towards large size than there were towards small size (Arnold et al., 1995). 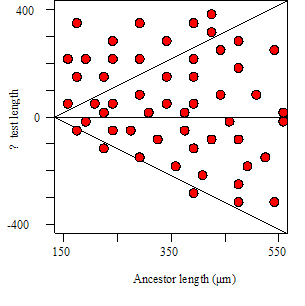 These results conflict with the views of Hallam (1975) and Kingsolver and Pfennig (2004), and suggest that for the size increase in foraminifera in the Cenozoic era, advantages to large size were not the mechanism behind Cope’s rule. Arnold et al. (1995) also took these results as the means to justify eliminating all size-dependant adaptive hypotheses as the mechanism and decided to focus on other means of phyletic size increase.